Japanese Episode 270: "Raibaru Taiketsu! Kamekkusu vs Lizaadon!" English Episode 608: "Can't Beat the Heat!" The battle between Satoshi and Shigeru continues! Shigeru has just released his Kamex, and it quickly defeats Satoshi's Heracross with a Hydro Pump attack. Satoshi's next pokemon is his Betobeton, who is able to hold its own against the water pokemon. However, after sustaining a Hydro Pump attack, Satoshi decides to recall his poison-type pokemon. Next up is Satoshi's Bayleef who, despite its type advantage, also falls before Shigeru's pokemon. Since Satoshi has already lost three of his pokemon, a five minute time-out is called. After the break, Shigeru switches his Kamex out with his WIndy, while Satoshi calls on his Kabigon to battle. Kabigon is able to come through with a victory after attacking with a Hyper Beam. Satoshi's winning streak continues as Kabigon uses Ice Punch to destroy Shigeru's Nidoqueen. Shigeru's next pokemon is Hassamu, who uses its speed to deliver a Metal Claw that knocks Satoshi's pokemon out. Satoshi brings his Betobeton out again, but Hassamu is able to use a combination of a throwing attack and Speed Star (Swift) to earn a victory. 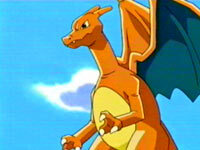 Satoshi only has one pokemon left, but he's saved his strongest pokemon for last--Lizardon. The fire-type quickly takes care of Shigeru's Hassamu, so Shigeru is forced to use his strongest pokemon--Kamex. As Satoshi's pokemon is busy dodging Hydro Blast attacks, Satoshi has his pokemon use its Flamethrower attack on the rocky field, confining Kamex to one spot. Kamex uses its Hydro Pump to cool down the field, and in the resulting steam Lizardon is able to move in close without anyone noticing. The fire-type uses Seismic Toss and, after a tense moment, Kamex falls! Satoshi has beaten Shigeru, enabling him to advance to the next round! Soon, it is revealed that the next battle will be between Satoshi and Hazuki! To be continued! This is where the Jouto League starts to go downhill for me. I'm not saying that because I don't like the battle in the episode. On the contrary, I think it's one of the best battles in the series. I agree with the outcome of every single battle in this episode, and I didn't feel like the anime cheated at all in order to award Satoshi the victory. However, it's what happens after the battle that annoys me. I guess this episode is supposed to be the conclusion of Delibird's dealings with the Rocket-Dan, since I don't think it appears any more in the future, and it's a really bad conclusion at that. The Rocket-Dan's debt isn't repaid, yet Delibird stops visiting them after this episode. What's the deal with that? Also, I think the anime jumped into the Satoshi and Hazuki WAY too quickly. There was no build-up, we didn't see any of Satoshi's preparations, nothing. We're just thrown into the start of the battle, providing a stark contrast to all the preparations and hard work that was put into the battle with Shigeru. As far as the dub goes, it's almost perfect compared to the last episode. Two seconds are cut from the opening pan shot. The scene where Kamex is twirling Bayleef around by its leaf is two seconds longer in the Japanese version. If you listen carefully, you can hear the music skip a tiny bit before Ash says "Bayleef! Hang on!" Satoshi and Shigeru's handshake right before the final commercial break is shortened by a second. Then, when we come back from the commercial break, a two-second shot of the sun in the sky is cut. Why is announcer in the Johto League given all the dialogue mistakes? Announcer: "Ash from Pallet Town has the honor to go first, followed by Harrison from Silver Town." Harrison lives in Littleroot Town, not this made-up "Silver Town." Two seconds are trimmed from the TO BE CONTINUED screen.